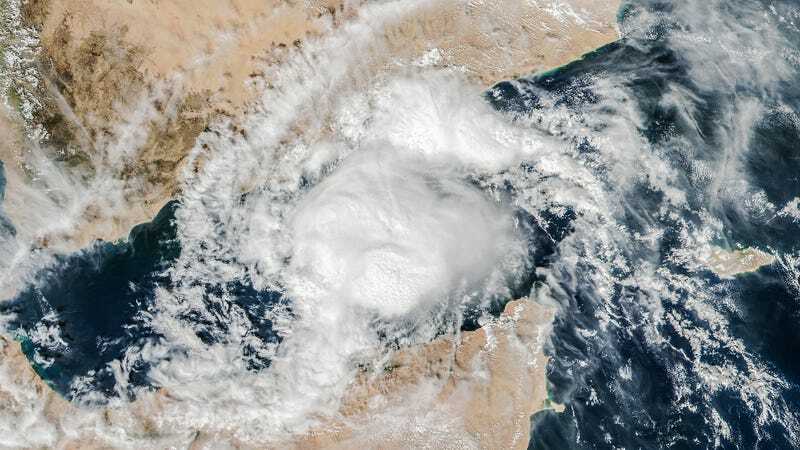 Yemen is not known for its tropical storms, yet the desert country is now facing its second major cyclone within a single week. Ravaged by civil war—and still recovering from Cyclone Chapala—Yemen is once again preparing for a bout of rainfall and flooding. Cyclone Megh, as the new system is called, has already wreaked havoc in a region ill-prepared for such anomalous weather. It struck the Yemeni island of Socotra on Sunday, killing up to six people and injuring another 60. Megh damaged houses, a central power station, and a hospital—all this in an area where cyclones are virtually unheard of. Last week, cyclone Chapala killed 11 people on the same island, while dumping nearly a decade’s worth of rainfall on the country in just two days. Megh is currently 43 miles (70 km) from Aden, Yemen. Three-minute sustained winds have been registered at 30 mph (55 km/h), so it’s not as vicious as Chapala. It’ll be downgraded to a tropical storm soon if it hasn’t already. But the winds are not the problem, it’s the rainfall. Yemen lacks the infrastructure and preparedness for storms like these. The country’s ongoing civil war isn’t helping the situation, either. According to several sources, water temperatures in the Arabian Sea and northwestern Indian Ocean were significantly above normal, approaching record highs, when Cyclone Chapala blew through the region in the first week of November 2015. One week later, the waters were somewhat cooler because Chapala had stirred up the sea surface and left a wake of upwelled water. The combination of cooler water and the dry winds from the Horn of Africa and the Arabian Peninsula should sap much of Megh’s strength, though not necessarily its precipitation. [Amato] Evan [of the Scripps Institution of Oceanography] noted that the development of Chapala and Megh were likely aided by a lack of wind shear, which typically disrupts tropical storm formation. In a 2011 paper, Evan and colleagues argued that increasing air pollution—particularly a six-fold increase in aerosols—over the northern Indian Ocean has likely reduced vertical wind shear in the region, a phenomenon that could affect monsoon weather patterns and perhaps allow more cyclones to form in the region. Crazily, there’s a third tropical depression now appearing on radar, prompting the Joint Typhoon Warning Center (JTWC) to issue a Tropical Cyclone Formation Alert (TCFA). Thankfully, the World Meteorological Association expects this system to break up shortly.